Story: Paul Johnstone the ShadowHawk was infected HIV and was looking for a cure. In his search he met Maul and Warblade from the team WildC.A.T.S. whom he helped. The WildC.A.T.S. wanted to help Johnstone in return and one of Spartan's synthetic bodies were refitted for housing Paul Johnstone's mind. The transfer made Johnstone insane and he had to be returned to his human body . It was however not all of Paul Johnstone's mind which came back to his body. A small spark of life was left behind . The spark of life in the robot turned out to be a part the Spirit of Justice which had been devided into four by the god Ra. This was discovered by the creature known as Tome collected all the fragments in the robot . 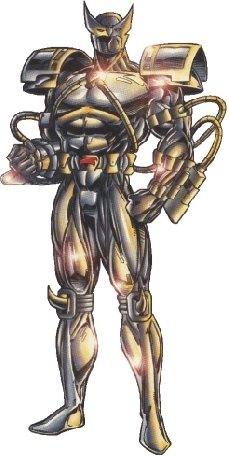 When the fragmented Spirit of Justice was collected in the ShadowHawk it became a perverted version of justice. Without the human compassion and intelligence it went on a rampage of death and destruction . The robot was finally destroyed by Youngblood and the head of the robot containing the Spirit of Justice was saved by the New Man, who gave the spirit to its next vessel, Eddie Collins .